This morning Lloyd and Donna Mills let me sleep in 'till 10am in their home in Caloundra and after some sandwiches for breakfast they brought me all the way to Noosa. I still don't understand how those Queenslander Australians think how anything is just around the corner, even if it's some 90 kilometres up north. Back in Noosa again, where I was last week, before the whole Steve Irwin-meeting came in between and I had to travel south again. It's Sunday and today my former host Glen Watson had invited me to come over again and to go fishing at sea today. That, of course, sounded 'crikey!' and wasn't really something I have done before ever, so I gratefully accepted his invite again. At 12.30 sharp I thanked Lloyd and Donna for letting me stay for a day at their place and met up with Glen on a wooden dock on the Noosa River. I boarded Glen's fishingboat SeaRaider and together with a friend of him from Sydney, we headed to the Pacific Ocean. We ankered at a place called the Sunshine Reef, which seems to be a reef on the ocean bottom at some 150 feet deep. Don't tell me personally how to find something like this in this big ocean, it was the navigation equipment that did it for us. A computer display showed how deep the ocean was and if there were any fish down there. Another display had direct contact with a sattellite and this GPS-control showed us exactly where the boat had to sail. And the fishing started good. Even before we arrived at the reef, Glen had put out three anglers and one of them had a bite! Within fifteen minutes Glen pulled up a yellowfin tunafish on his hook! 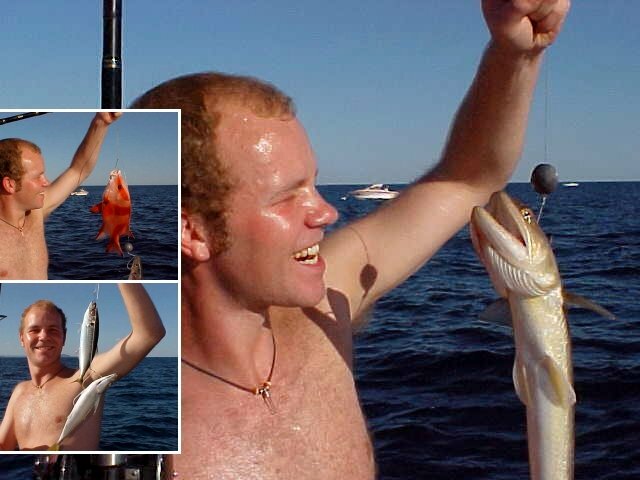 It ended up pretty bloody on the boat, as the fish was very aggressive. The tuna ended up in the box and will be Glen's dinner for later this week. After arriving at the reef Glen's friend lowered the anker and we were ready to start fishing. And I am not such a fishing person, mostly because I am too impatient for it. If I fish, I want to catch something, not just sit around and wait for hours. And I was lucky, because the fish loved my bait! Every ten minutes we all seem to have good fortune, as we pulled happy grinners and other (too little) fish out of the water. The sun was shining bright, the ocean was very still and The Best of the BeeGees raved from the onboard CD-player. I just hoped this sort of music wouldn't scare the fish away. And while we were fishing and being concentrated on our lines, bait and catches, I suddenly heard a big airblow right next to me. What was that!?? 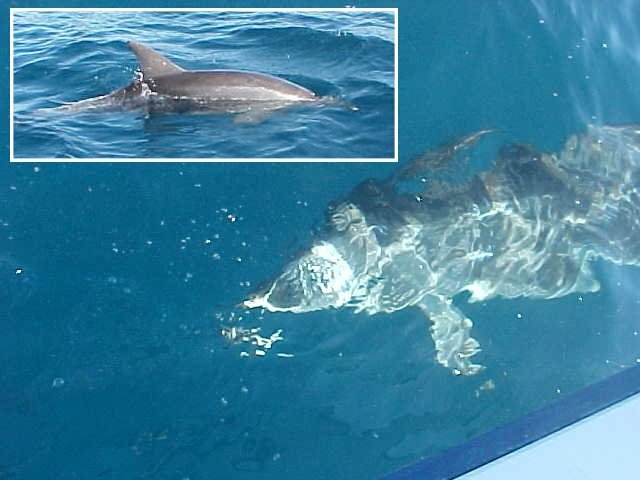 All of a sudden a dolphin appeared next to the boat, just swimming around and getting lots of attention from us. The happy grinners that we caught weren't suitable for dinner parties, so we fed them to the happy dolphin. That was so incredible! It was around four o'clock and a bottle of suncreem later, when we had to return back to the Noosa rivermouth, as we could only enter the river during high tide at 4.30pm, otherwise we wouldn't be able to pass the sandbanks. We me sitting at the front of the boat, we cruised along the beautiful calm Noosa River and watched the sun go down around 5.30. I had almost imitated Leonardi DiCaprio here, but behaved just in time. Arriving in the Noosa suburb Tewantin, Glen and his friend raised the boat from the river onto a trailer and cleaned the boat from the outside with a hose. The boat used to be from Glen's father, who gave it to him, and his father Max had been fishing with this boat for over 25 years. And talking about his parents, that was where I'd stay tonight. Glen had to head back to his office in Sydney very early tomorrow and he arranged that I could stay with his folks Marilyn and Max for the night. The boat and me were dropped off at their home and I met up with the oldies who were very happy to accommodate me. With pride they told about this Danish exchange student who once stayed here a full year and who loved boats and fishing. What a time he would have had here! I was desperate for a shower and I noticed that I must have been smelling of fish as the bath room was the first room that Marilyn pointed out to me during a tour through their nice home, also surrounded by tight greenery. I joined them for dinner and Marilyn spoiled me with ice creams and fruit. With a cup of coffee I had to settle behind my laptop again and write up some stories about the last few days. Sunday is always the day when I have to do some extra writing as I write syndicated column for Dutch newspapers. And I had quite some stories to tell about the Australian Zoo, flying, karting and fishing! Another exciting day starts tomorrow morning, very early, as I will be picked up for a stirring daytour to and on the world's biggest sand island, Fraser Island.